Sir Alex Ferguson and Arsene Wenger are both predicting the upcoming Manchester United-Arsenal Champions League semi-final will produce two classic matches. The two legs of the tie, on 29 April and 5 May, will be the first time the two fierce rivals have met each other on the European stage. "We always produce exciting games. 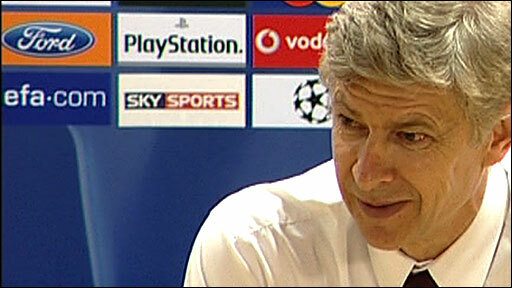 Both teams go forward so it will be a promising semi-final," said Wenger. Ferguson added: "That it's an English side gives it a different spice." With the first leg taking place at Old Trafford, Ferguson has already set his sights on taking a lead to the Emirates. 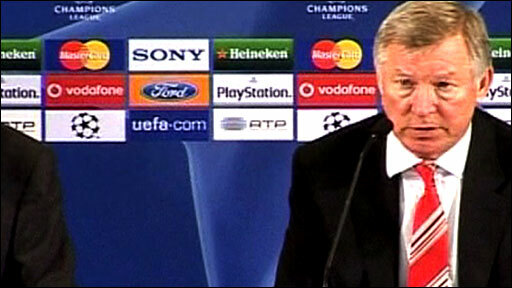 "We are two good footballing sides, so it should be a terrific semi-final," said Ferguson. "Our game earlier in the season was fantastic. It was the way football should be played and we will look forward to it. Both teams are also vying for the FA Cup, with their semi-finals 10 days before the Old Trafford encounter, while the end-of-season run-in will ensure it comes down to "form on the day", according to Wenger. "You have two teams with the same programme," said the Frenchman. "We are in the semi-finals of the FA Cup and both have a game in hand to play the week after. "I believe that the form of the day and how much we can manage to be physically well on the day will have a big impact. "We are up for the challenge and it will be very interesting. I would not like to speculate on any weakness of Manchester United - it is always difficult to play an English team because of their quality." Arsenal beat Manchester United 2-1 at The Emirates earlier this season, and the teams are scheduled to meet again on the penultimate weekend of the Premier League season. Ever since Ferguson suggested Wenger was "a novice who should keep his opinions to Japanese football" towards the end of the Frenchman's first season in the Premier League, in 1996, the rivalry between the two clubs has veered between fierce and explosive. In the 1997/98 campaign Arsenal won the Double after overturning United's 12-point Premier League lead in a sensational late season charge that included a 1-0 victory at Old Trafford. The following season - United's historic treble winning year - the Red Devils beat the Gunners in a famous FA Cup semi-final replay in which Roy Keane was sent off, Peter Schmeichel saved a Dennis Bergkamp penalty and Ryan Giggs scored a stunning solo extra-time winner. In Arsenal's 2003/04 'Invincibles' season a fiery clash at Old Trafford erupted in a brawl in the tunnel after the game as a result of the Arsenal players taunting Ruud van Nistelrooy after he missed a late penalty. Probably most famously of all though was in 2004 when players and staff clashed in the tunnel after United's 2-0 win at Old Trafford brought to an end the Gunners' 49-game Premier League unbeaten run. During the clash Ferguson was said to have been hit in the face by a slice of pizza, causing the incident to be known as 'Pizzagate' or the 'Battle of the buffet'. Despite their familiarity with each other after decades of battling it out at the sharp end of the league, the semi-final will be the first time the two teams have ever met in the Champions League. "I'm looking forward to it," said United striker Wayne Rooney. "The only other English team we've played against in this competition was Chelsea, so it should be an exciting couple of games and hopefully we can overcome them." Cristiano Ronaldo, whose memorable goal against Porto sealed United's progress, added: "We have an opportunity to win everything and we are very confident that we can." And Arsenal forward Theo Walcott, who opened the scoring in the second leg against Villareal, said he is under no illusions about the size of the task facing the Gunners. "It will be very difficult," he said. "We always do well against them in the league but they are probably the best team in the world, I'd say, so we'll find it tough. "But as long as we dig in and try to play like we did tonight, I'm sure we'll be fine." Barcelona and Chelsea contest the other semi-final, meaning this year's final could be a repeat of last year's showpiece, when Manchester United beat the Blues on penalties, while Arsenal faced Barcelona in the 2006 final, losing 2-1.